NETWORK UPDATE: The SHARK TANK rerun lost 0.1 in final numbers, and so did the rerun of GRANDMA GOT RUN OVER BY A REINDEER on CW. CABLE HIGHLIGHTS: Discovery’s GOLD RUSH took Friday cable, up 0.13 to 1.16, with lead-in GOLD RUSH: THE DIRT up 0.04 to 0.43. ESPN’s NBA doubleheader was at 0.66 (Clippers vs. Spurs) and 0.44 (Pelicans vs. Suns), compared to last week’s 0.58/0.46. On Syfy, the season finale of Z NATION jumped by 0.14 to 0.42. 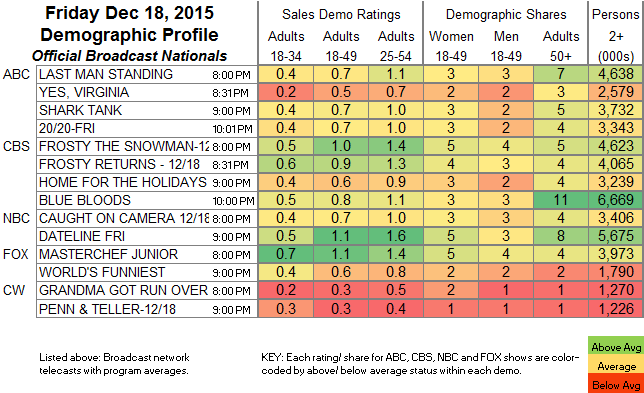 We’s MARRIAGE BOOT CAMP climbed 0.02 to 0.32. On HGTV, TINY HOUSE HUNTERS was at 0.31. 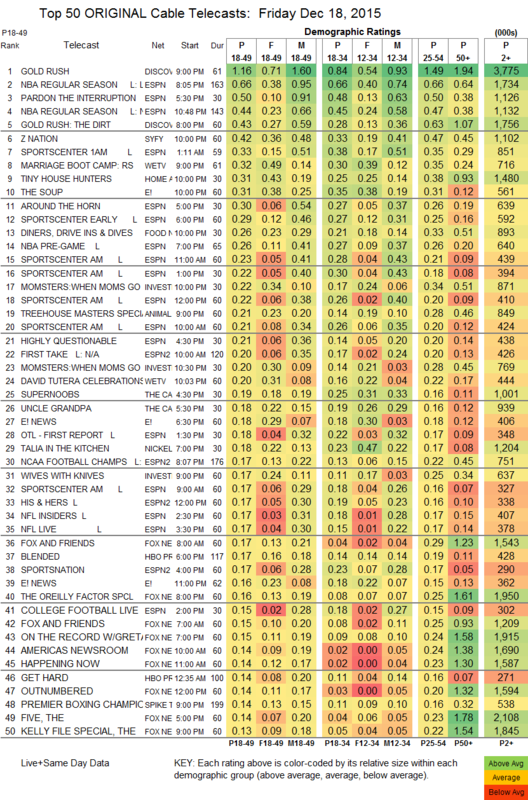 The series finale of E!’s THE SOUP shot up by 0.19 to 0.31. Food Network’s DINERS, DRIVE-INS AND DIVES shed 0.02 to 0.26. USA’s SATISFACTION found little, down 0.05 to 0.12. A&E’s UNFORGETTABLE fell 0.05 to 0.10. On Lifetime, the BILLBOARD WOMEN IN MUSIC special was at 0.10. Cinemax’s season finale of THE KNICK edged up 0.01 to 0.05.